When I left for Boston the powder room looked like this. The black faux marble countertop was scuffed and sucked all the light from the room. Even after we changed the light it was still a tiny space under the stairs. 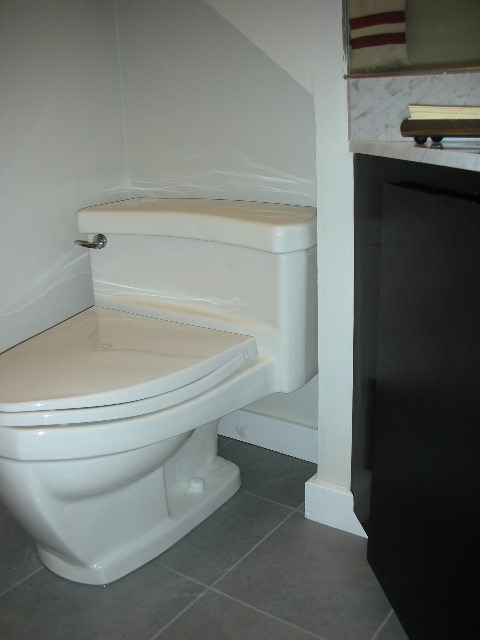 The toilet was sitting on a white faux marble plinth that raised it to the height of the cream shag carpet. Funky, and not in a good way. The day before I was to leave The Handyman said he could start the renovation. I wasn't about to let him go work on someone else's house just because I was out of town so I left instructions and The Guy in charge. Apparently there were a few minor hiccups along the way; there had been a leak under the carpet for some time and the floor behind the toilet had rotted (potentially a guest could have sat on the john and ended up in the basement, not what the sort of memory you want your guests to carry away with them) so some wood had to be replaced; the waste pipe had to be lowered so the floor could be tiled, which required some extra plumbing. 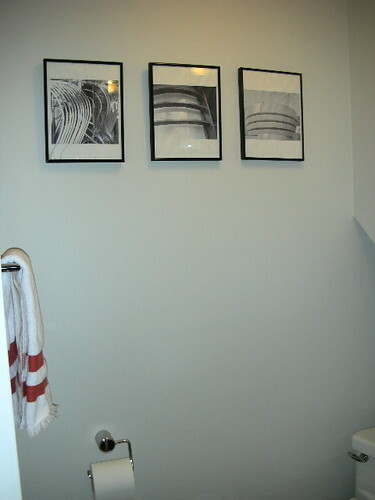 These were unforeseen and cost both time and some extra money, but thanks to our meticulous and unfazeable handyman the powder room was remodeled by the time I returned to The Cool House. 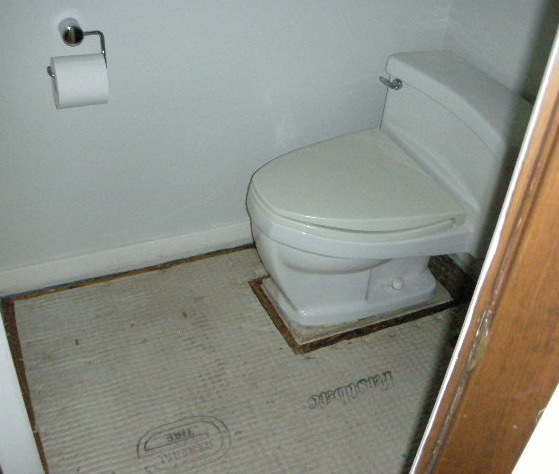 The floor had been tiled. The toilet re-installed and a new seat purchased for it. The Guy won't tell me how much it cost but The Handyman made him approve the expenditure because it was so expensive, so I'm guessing it wasn't $24.99. The towel bar is attached to the wall (so much more useful than sitting in the cabinet) and the walls have had an extra coat of paint. And most spectacularly, the real Carrara marble top, Oceana vessel sink and dornbracht look-alike faucet had been installed. A full month after I wrote this it's done, completed, finished. I love everything about it. 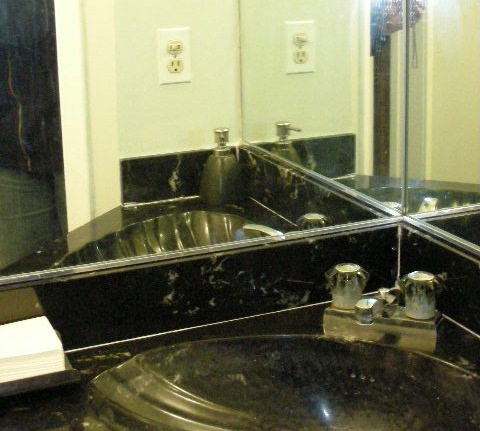 Those fixtures we kept, the original toilet, the black vanity and the huge mirrors no longer keep the powder room stuck in the 1970s. They've been magically transformed, the light reflecting in the mirrors from the marble, glass and chrome updates the space and makes the room seem twice as large as before. I swear I could dance in here now. Your bathroom looks amazing. I really like the changes (especially the tile). Nice work! Your loo looks lovely. 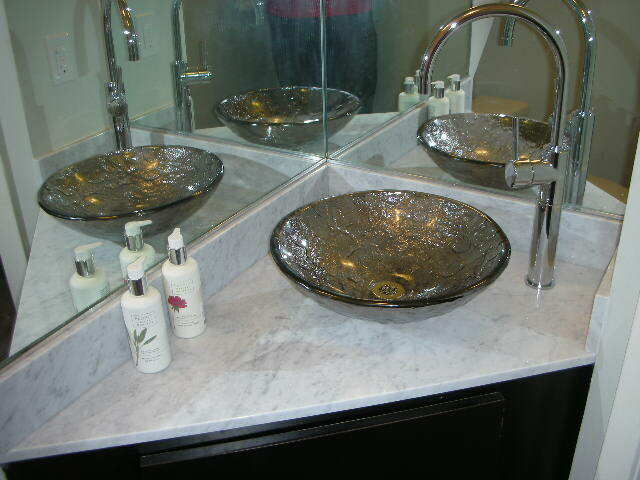 I especially like the carrera marble top and the faucet. i covet your carrera marble!! Very nice! I love the use of texture to play up the room. I love it all! Wow, one month! You are my hero! Love your counter and the gorgeous sink and the faucet.. dreamy! You have fabulous taste! How did you decide what to keep? Thanks for sharing with us. Oooh! the countertop and sink look great. Sharp!! "Funky-not in a good way." Shag near a toilet would always be funky in a bad way.